The APNS expressed its grave concern on the threats and ultimatum issued by outlawed organizations to media houses and media workers operating in Balochistan and termed these threats as harassment and attack on press freedom in the country. Sarmad Ali, President and Umer Mujib Shami, Secretary General of the All Pakistan Newspapers Society have stated that the media houses in Balochistan province have received written threats from the militant organizations demanding full coverage of their activities and their point of view on the events, failing which, they will have to face dire consequences. 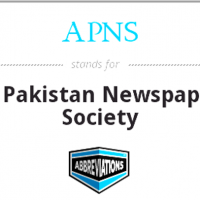 The APNS is of the considered opinion that the print media in the province is objectively giving coverage to the events in the province within the limits of the law, hence, any threats and dictation to the media was uncalled for and counter productive. They stated that any effort to strangulate the media, would not be accepted. They reiterated that the media will brave the situation and protect its survival and freedom of press.